Gum Grafting for Beautiful Smile! The first thing that people notice in your smile is your teeth and gums. While crooked and stained teeth can be easily fixed with the help of filling materials, you still won’t be able to enjoy a perfect smile if you have very short or overly exposed gums! Gum recession refers tothe shrinking of gums. It has two main adverse effects; It exposes part of the root allowing sensitivity and faster decay of teeth, which will ultimately affect your overall health. At the same time gum recession totally mars your smile, affecting your social acceptability and effectiveness. These are indeed serious consequences. But all is not lost yet!Our dentists at Barnaby Square Dental can restore your looks and your dental health by a simple gum grafting procedure. Gum grafting is done to prevent further gum recession and to cover the root surface already exposed. A small piece of healthy tissue is taken from another site in the oral cavity and is attached at the required point. The graft tissue for the gum may come from various sources, but normally tissue from back of your own palate is preferred. The donor site is numbed and the desired amount of flesh removed. This tissue is then carefully sutured into place at the required location. Very fine thread, perhaps finer than your hair, is used to do the suturing. From here on your own body vitality starts acting. Gradually, new blood vessels grow into the grafted material and allow the grafted flesh to integrate with the tissue surrounding the receptor location. A successful graft will eliminate or mitigate the problems for which it was applied, e.g., tooth sensitivity and poor smile. Do You Need a Gum Graft? How do you find out whether you need a gum graft? Quite often you will know it. You can see the tooth root being exposed, and more and more of the tooth being bared. The teeth may acquire a longish look. The exposed part of the tooth will appear somewhat darker than the rest of the visible crown. Often, you can clearly see or feel the problem. Exposed tooth roots can make your teeth look overly “long,” and they also generally appear somewhat darker than your pearly white crowns. Gum recession is also associated with advancing age. This has given rise to the expression “long in the tooth”. The ill effects of gum recession go far beyond the aesthetic disadvantage. Your gums cover the root of your teeth. While the crown (visible part) of your tooth is covered with enamel, the hardest of tissues in the human body, the root is only covered with dentin, which is not as hard. The gum tissue gives two types of protections to the tooth root. Mechanical, against biting and chewing forces, and biological, against bacterial penetration. Gums can begin to recede due to one or more of several reasons. Improper oral hygiene– this is probably the most frequent cause. Inadequate brushing and flossing fails to remove the plaque. Excessively vigorous brushing – or brushing with a hard brush will erode and irritate the tissue making it recede. Foreign objects in the mouth – sometimes poorly fitting removable dentures (conventional denture tend to loosen), tongue bolts, etc., which rub against the gums can result in gum recession. Even finger nails can do that. What Happens When You Have Gum Recession? Even minor trauma to the gum can occasionally trigger gum recession. Whatever the reason for gum recession, it may ultimately result in tooth loss-a very serious consequence functionally and esthetically. A gum grafting procedure will be advised by our dentists at Barnaby Square Dental, only after a thorough examination and proper assessment of your dental and overall health. The source of graft tissue can be an area next to the proposed graft site, from the hard palate, or donated tissue from another person after it has been medically processed to make it safe. Grafting procedure will depend somewhat on the purpose of the gum graft. If grafting is required in an area of the mouth which is not very visible during talking or smiling, grafting is required only to prevent further gum recession. Graft tissue is simply attached there. Tooth root need not be covered completely. This procedure, called ‘free gingival graft’, and it takes just about 45 minutes. The success rate of this procedure is also very high. 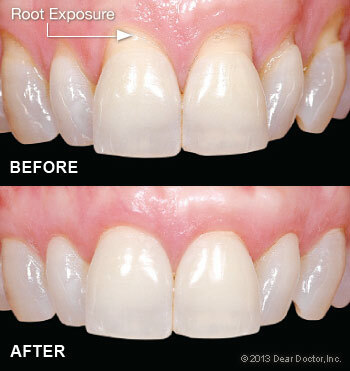 If complete root surfaces are to be covered the procedure is more involved and takes much longer. Is Gum Grafting Procedure Painful? Grafting procedures are not painful because they normally carried out under anesthesia. Even after the procedure the pain can usually be alleviated by over the counter pain killers. A soft diet should be used for week, and antibiotic may also be advised. Normal working activities will not be disturbed. Having gone through this exercise it is even more important to ensure good oral hygiene to prevent future problems. Regular brushing with fluoride tooth paste, daily flossing, a healthy diet, and regular dental / periodontal checks will help prevent problems in future. Healthy gums will help a good overall health and a beautiful smile.